A new poll indicates that Gov. Rick Perry's lead over Democrat Bill White is shrinking. (CNN) – Texas Gov. Rick Perry, once thought to be the clear favorite to win his reelection bid this November, finds himself only 6 points ahead of Democrat Bill White, according to a new survey. A University of Texas/Texas Tribune poll out Monday indicates Perry leading former Houston Mayor Bill White by a 39-33 percent margin among registered voters, a spread that has shrunk from the more-than 10-point lead Perry enjoyed during most of last spring and summer. And, given the poll's 3.5 percent sampling error, the race may essentially be a dead heat two months shy of Election Day. Twenty-two percent of those questioned say they are undecided. 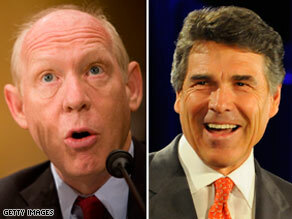 "White has not yet faded and remains in striking distance of Perry," sas Daron Shaw, a co-director the poll. "The downside for White is that Perry is up by 18 points among those who say they are extremely likely to vote. White needs a big turnout among young voters and minorities to be competitive." In what may be good news for White however, a large number of undecided voters are independent or tilt moderate. "There are a lot of people out there who are not ready to respond to a poll about who they're going to vote for," said the Tribune's Jim Henson. "If you look at the breakdown, there are a lot of moderates and a lot of independents." Perry is bidding for a third full term as Texas governor. The poll surveyed 800 registered voters by telephone and was taken September 3-8. It has a sampling error of plus or minus 3.5 percent. I am a libertarian and will vote along party lines except for this critical race. Bill White has my vote. This race is just too close to let Perry slip by. We want the twin of G W Bush out!! Skewed polling to try to create a false impression. 800 registered voters in Austin polled, out of over 12 million Texans and you think that ex-mayor goober has a snowball's chance in hell of winning? He lined his pockets while working in the Clinton WH and lined his pockets by directing relief money to his firm while mayor of Houston during Katrina. Typical Democrats, like giving family members illegal scholorships. November 2nd, 2010 will be a day the Democrats see their rule ended for decades. Go BIll White! As a teacher, Perry does not care about education. I'm done with him.